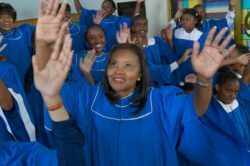 The Pew Research Center has just released a new report on the religious lives of African-Americans. Here are five facts Pew highlights in their report (which is released in celebration of Black History Month). We encourage you to read the entire report for more understanding of the differences in religious practice and affiliation between African-Americans and other ethnic groups in the United States. 79% of African-Americans self-identify as Christian. This is in comparison to 70% of Whites and 77% of Latinos in this country (as of 2014). The first predominantly Black denominations in the US were founded in the late 18th century. Today the largest predominantly Black church is the National Baptist Convention. Other large churches include the Church of God in Christ and the African Methodist Episcopal Church (AME). Despite similarities in how US ethnic groups identify as Christian—by many measures, African-Americans are more religious than either Whites or Latinos. The proportion of African-Americans identifying as “religiously unaffiliated” has gone up in recent years. This shift mirrors national trends. 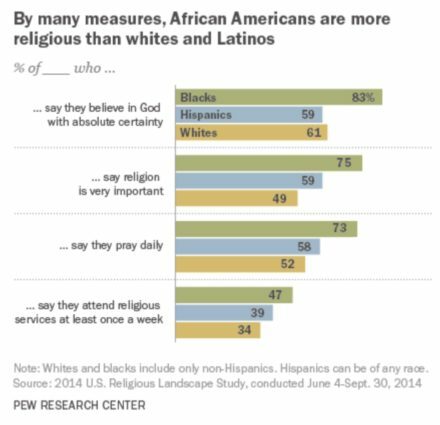 In 2007, only 12% of African-Americans identified as “religiously unaffiliated”. When the Religious Landscape Study was repeated in 2014—that number had grown to 18% with younger African-American Adults more likely to choose that descriptor than older adults. Historically African-American Protestant churches are more likely to be attracting older African-Americans than younger ones. This may reflect the reality that younger Americans are leaving traditional churches. For the African-American community, about 63% of Americans in the Silent Generation (born between 1928 and 1945) attend historically black denominations while only 41% of African American Millennials say the same.